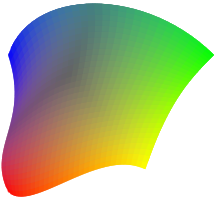 The current SVG standard 1.1 provides elements to define linear and radial gradients which allow to fill a region with a smooth transition of colors along a specified vector. In comparison to the PostScript language, these gradient variants are rather limited. 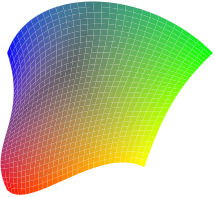 PostScript supports seven different types of gradients including function-based shadings, Gouraud-shaded triangle meshes, and tensor-product patch meshes. Therefore, it’s not possible to map complex gradient definitions present in EPS files or PostScript specials to native SVG 1.1 constructs. The number of segments can be changed with option --grad-segments which defaults to 20. Increasing the number leads to better, more realistic results but also increases the size of the SVG file as each segment must be represented by a separate path element.